Paddock stands are an invaluable tool not only for race and trackday bikes, but also for the home mechanic. Whether you are changing tyres or simply cleaning your bike, you need to lift the wheels clear of the ground. Unfortunately many modern motorcycles, don't have centre stands, so the easy solution is the paddock stand, and with the fitment of paddock stand bobbins or cotton reels, the job can be made a lot easier, and some bobbins double up as rear swinging arm sliders. 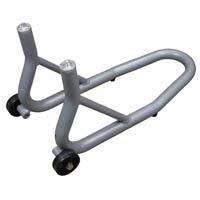 Tubular wheel chock supports front wheel of bike during storage and transit. Motorcycle Aluminium Race Front Paddock Stands are manufactured from ultra lightweight aluminium. Motorcycle Aluminium Rear Race Paddock Stands are manufactured from ultra lightweight aluminium. 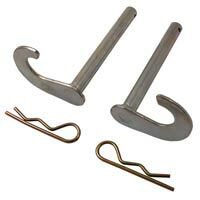 Swinging Arm Bobbin hook adaptors replace standard paddock stand cup adaptors. 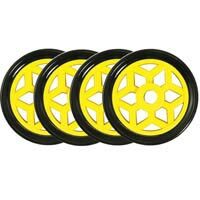 Set of 4 robust upgrade rubberised wheels, for Biketec Motorcycle Aluminium Race Front and Rear Paddock Stands. 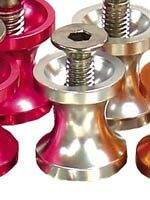 Paddock Stand Bobbins / Paddock Stand Spools / Paddock Stand Cotton Reels. 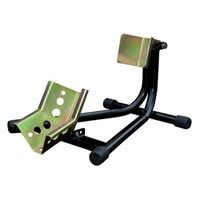 Designed to be used in conjunction with paddock stands and paddock stand hooks. Available in 5 colours and 3 thread sizes.